It's always good to have a spare. And with t-zones being so affordable, you can. Just pick your favorite color, or two, or three. 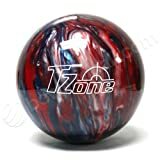 Great ball for kids, beginners and spare shooting. This ball glows under the black light.